New in the JUMP app within the last few days (thanks Matt for noticing) are drop zones, marked with a green lightning bolt icon. I thought these might be charging hubs, promised for ‘some day’, but they are drop zones, just regular JUMP system racks (exclusive JUMP racks and other racks that were part of the SoBi system). I checked three of the 12 racks on the Sacramento side, and none are charging racks. This makes me question the assumption I made that the green hubs in San Francisco are charging hubs; they may also be just drop zones. I’ll be in SF tomorrow and will report. The purpose of the drop zone hubs is to accumulate bikes that need charging so that it is easier for JUMP staff to locate them and return them to the West Sacramento warehouse for charging. The city hall hub had five ‘in repair’ (very low battery) bikes parked there this afternoon, so the idea is working to at least some degree. JUMP is offering an incentive of 50 cents for returning a low battery bike (shown as a $ icon) to a drop zone hub. I did this twice this afternoon, and got the promised 50 cent credit on my account. If you tap on the drop zone hub, it says “Bring a bike with a ‘$’ icon to this drop-off zone. 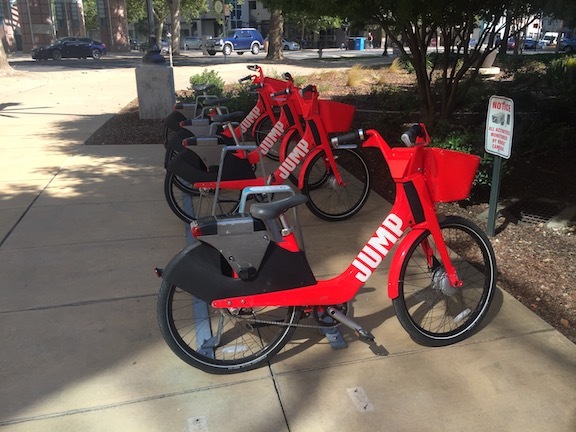 The trip will be free and you will get up to $6.00 in credit.” If you tap on a $ bike, it only offers $0.50, so I assume that is the default and only value for the JUMP Sacramento region, at least at this time. I finally got a clarification of why I was seeing $ icons in my app, and other people were not. I am a member of both the San Francisco and Sacramento systems, so my membership in the SF system causes these $ to show up. Of course now everyone should be seeing the $ icons and drop zone icons in their app, even if they only have a Sacramento membership. I’m hearing local noise re upcoming “charging hub” location negotiations with several in-progress central city development projects. Any ideas re who’s managing these from the City’s purview? Has anybody seen the actual contract details re these aspects of the Jump progressive rollout? I do not have any details or confirmation. The city knows, but all of the partner organizations are holding information very close. Must be part of all that “transparency & public outreach” City seems to flack at any and every opportunity, huh?!? On an only marginally related note, have you heard any thing of how or when SoBi is planning to transfer our existing Tower Bridge account balance to our Jump accounts. I have asked support and gotten no response on that. They are usually good about responding quickly, but not on this. Davis has 8 drop zones, and no regular hubs, West Sacramento has 2 drop zones, and 12 regular hubs, and Sacramento has 12 drop zones, and 49 regular hubs. I returned two bikes yesterday. Just checked my account and what I see looks like they reduced my rental cost each time by $0.50. I admire this very practical solution to gathering bikes for recharging. Win-Win. One of the locations for dropping off bikes is on Folsom/51st in front of Track 7’s new restaurant/pub The Other Side. That means $0.50 off of your beer.